Nothing compares to unwinding after a long day at work. All of the stresses of the job seem to melt away when you find your happy place and simply choose to relish in such state of being. What better way to let go of your problems than with a blowout? Many believe that a blowout is nothing more than a hair blow drying session coupled with a few curls for styling. There is more to the nature of blowouts then these elements, though. The stylist must manipulate each section and smoothly transform wet hair into a dry masterpiece for a blowout to work. 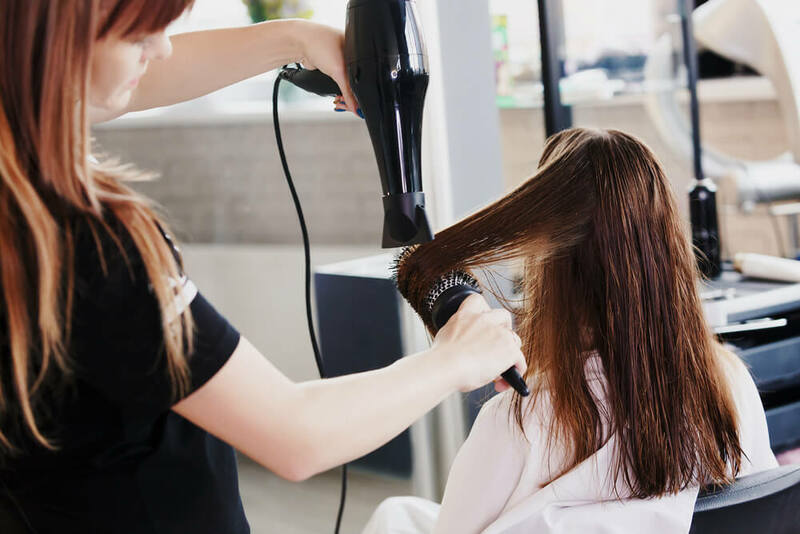 The process is usually carried out with a blow dryer and round brush and involves lifting the hair off the scalp. Stylists hope to maximize the finished product by lifting the hair away from the scalp since the natural oils have the opportunity to spread more evenly when strands are separated. Most blowouts last for two or three days without needing a re-touch or do-over. Those with textured hair may benefit from the process more than women with thin hair with styles lasting up to a week on naturally curly hair. Too many women work their fingers to the bone without ever thinking to invest in themselves. The kids’ soccer game is ultimately for their pleasure, and your husband’s company dinner party is so that he will look good to the bosses. What’s in it for you, though? A blowout is one way to relieve stress. Stylists usually provide a comforting scalp massage with shampoo sessions that are nothing short of therapeutic. Imagine the stresses of the day melting away with every pulsation. Such is possible when you have a blowout. The average blowout session is held in a social setting. It is quite evident that women, for the most part, do not go to salons because they cannot do their hair for themselves. The salon experience is often times more of a social necessity than a cosmetic desire. You can come to a blow dry bar feeling horrible about the circumstances of your life and leave with a different perspective. The magic of a blowout is not just surface-deep but an internal experience as well. A blowout can leave you feeling your best. There is nothing like going to the salon and getting the perfect hairstyle. Your confidence level can easily go from zero to ten when you look in the mirror and know that you are absolutely slaying. A blowout is a great way to increase self-esteem right before a job interview or big proposal at work. Stylists can reach all angles of your head. Perhaps you do not buy into the notion of a blowout session revolutionizing your way of thinking. You cannot deny the stylist’s ability to comfortably hit all aspect of your head during a hair appointment, though. You may have difficulty reaching the back of your head when blow drying at home. A skilled specialist, however, can thoroughly dry your hair since she is standing behind you for much of the session. You may one who thinks that the salon experience is not your style. You have not known true pampering, though, until you have enlisted the services of an expert for a blowout session. Blowouts are short, fun, and a great way to straighten your hair without adding too much heat to the mix. Every woman needs a blowout! Schedule your blow out at Blow & Go Blow Dry Bar today by calling 817-757-7877. For the latest scoop on promotions, events and everything Shops at Willow Park. The Shops at Willow Park is a development project brought to you by Wilks Development.